GRAND ISLE – Parizo Lane in Grand Isle has become a local political hotspot, after plans were announced to pave the private road last week. Several residents had asked the town to pave the road to eliminate erosion and car damage due to weather and general mudseasonicity, and the plan to pave was approved unanimously at a budget meeting, with work slated to begin in July. Within hours of the vote, a protest group had formed and were already camped out at the end of Parizo Lane with signs reading “Save Our Streets!” and shouting to both passing motorists over the course of the day. 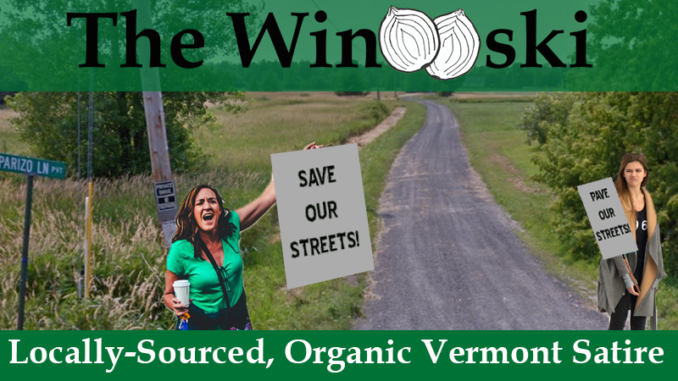 The group leader, Annie Deluvian, says that she and her fellow residents are also trying to stop erosion, the erosion of Vermont culture and its landscape. She says they will not stand by and watch all of the roads and streets in the state be covered over with the wicked mark of mankind, and will lie down in front of any paving vehicles that come their way. This protest has now been met with a counter-protest, as the original residents who had petitioned for the paving project met across the lane from Deluvian with signs reading “Pave Our Streets!” and “I can’t drive 25!” The group has vowed to lie down in front of Deluvian before she can get to the road to lie down in it. “They’ll have to step over us if they want to block progress!” said group member Anne Ava D’Belle. Police are standing by, but have not intervened at this time. There’s no police in Grand Isle, only sheriffs.